I preached on this passage a few weeks ago, and have been reflecting on it off and on since. Not only is an evocative and poetic image, but it reveals just how misguided and short-sighted we can often be in our approach to the announcement of “the sufferings of Christ and the subsequent glories” (v. 11) that we hear in the gospel. The gospel fills us with wonder and awe…at least it should if we understand it properly. Verses 10-12 flesh that idea out a bit by celebrating the scope and span of the good news. Throughout history, the prophets “searched intently and with the greatest care”. They knew that this news mattered more than anything else—more than foreign invasions, more than exile, more than famine, and more than anything—because they knew the gospel was the only news that made sense of all the wrong that we see and can provide hope in the face of suffering. Throughout eternity, the angels delight in seeing the gospel unfold and long to see the day when it is fulfilled. Peter uses a word that means “straining to see”, bringing the idea of standing on tiptoe or crowding around something whose beauty is incomparable. Cute…but not what Peter meant. First, a note on who/what this refers to. “Angels” in Scripture does not refer to humans who have died and now exist spiritually. That’s how we typically use the term, but it’s not biblical. Humans don’t become angels when they die. “Angel” is a word that literally means “messenger” and they are created beings, just like you and I, but of a different order. They are part of God’s spiritual creation. This means that even those who have served God at the foot of his throne and dwelt in his presence throughout the ages long to look into the good news of salvation in Jesus Christ. If the angels long to look into the wonder of the gospel, who are we to think we can ignore it? God forgive us if we treat the gospel as something quaint or irrelevant or juvenile. As Paul wrote, “I am not ashamed of the gospel, because it is the power of God for the salvation of everyone who believes: first for the Jew, then for the Gentile. For in the gospel a righteousness from God is revealed, a righteousness that is by faith from first to last, just as it is written: ‘The righteous will live by faith.’” (Romans 1:16-17). God’s people throughout the ages have focused intently upon the announcement of grace that we find in Jesus Christ. Remember this, because we cannot think that we’ve somehow reached a day when the gospel is irrelevant or outdated. It is the height of arrogance—and the depths of ignorance—to think that the good news of salvation in Jesus Christ is something that was appropriate for a more primitive age but that we’ve now somehow now reached an era of human enlightenment and progress that makes God’s eternal purpose obsolete. Some things do pass by the wayside of history. Medical advice from the Middle Ages (“You’re sick? Throw some leeches on it!”) is justifiably ignored today. But do not make the mistake of thinking that the news of God’s grace in Christ was only for a bygone era. Nor can we make the error of thinking that somehow we are supposed to “progress” past the gospel. Martin Luther said, “The gospel cannot be preached and heard enough, for it cannot be grasped well enough.” We need to hear the gospel constantly. There is nothing bigger, better, or more achingly beautiful than the announcement of grace that we hear in the gospel–yet many have a hard time identifying the message. So here it is: You are a rebellious sinner who stands guilty and convicted before an infinitely holy God—yet that same God, in the person of Jesus Christ, came down and fulfilled all righteousness in your place, earning every spiritual blessing for you, and then suffered and died the death that you should have died as a penalty for your lawlessness and sin. On the third day, Jesus Christ, God-in-the-flesh, rose from the grave and forever broke its power over us. He is ascended at the right hand of the Father, and is coming again to judge the living and the dead. Therefore, repent and believe. One thing that frustrates me is when I’m watching the news is when they start flashing graphics for “Breaking News”, and then it turns out to be something inconsequential like finding out that some celebrity couple split up. “Breaking News” should be something big that has enormous implications and ramifications. Think of the old pictures that show people celebrating in the streets when they heard the news that World War II was over. The bigger the news, the bigger the celebration and response it generates. The message of grace that we have heard is bigger and better than anything, yet we often trivialize it or think that hearing it once and then moving on to the “deep things” is what we are called to do. This announcement of a Savior who suffered and is now glorified must be something that captivates our attention and ignites in us a desire to go and announce it to others. Whether you are traveling overseas or just walking across the street, go with confidence, knowing the unparalleled power and worth of the news that you carry. The gospel not only spans all times, places, and people, but also is the only source of grace for the same. The gospel is not purely individualistic, and it is certainly not irrelevant. It is the proclamation that echoes throughout eternity. It is the news of such captivating splendor and infinite depth that even God’s celestial court longs to gaze into its beauty. The Church does have something relevant and worthy to give to the world—in fact, it has the only thing of ultimate relevance and worth: the good news of Jesus Christ. No news is as big or beautiful as the news that we have salvation in Jesus Christ. 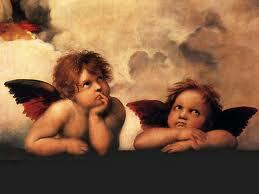 Angels long to look into the gospel. Do you?